In contrast to the serene coastal landscape to the west, San Diego's East County wilderness is one of the most diverse areas in the county. The region boasts a beauty all its own, with rolling hills, majestic mountains, sparkling lakes, and deep canyons. 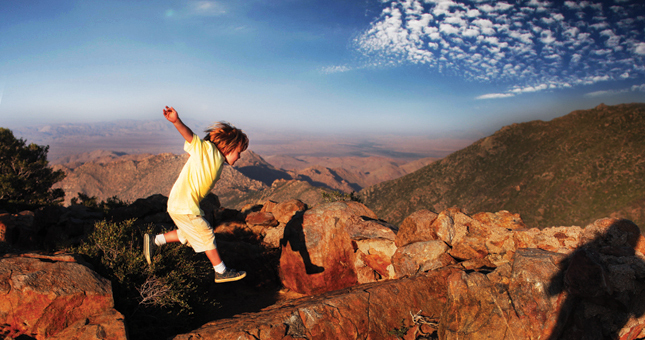 With the Anza-Borrego Desert State Park and Cleveland National Forest nestled in the region, outdoor lovers of all types will revel in a wondrous natural playground to explore and discover. East San Diego County offers hiking, mountain biking, rock climbing, fishing and camping in the vast and beautiful wilderness. Spend an afternoon hiking Cowles Mountain, mountain biking through Mission Trails Regional Park, strolling along Lake Murray or fishing on El Capitan Reservoir. In addition to outdoor adventures, East San Diego County boasts plenty of entertainment. Sizzling Las Vegas-style Native American casinos, luxurious resorts tucked right into the rugged landscape, challenging golf courses built around natural obstacles, historic sites and highways, and annual festivals and rodeos can be enjoyed, all within the expansive landscape of California's wilderness country. One of our favorite day trips to East San Diego is the historic mining town of Julian. Set against the backdrop of the Cuyamaca Mountains and countless apple orchards, this quaint town is as famous for its apple pie as it is for its collection of gold mines (several offer tours geared toward children). Julian offers a variety of restaurants, bed & breakfast hideaways, antique stores, art galleries and nearby hiking and nature walks. Visit us at the California Welcome Center Alpine, located off CA I-8 (both West and East bound). Take the Willows Road exit to the Viejas Outlet Center. We are situated between Nike and Dress Barn.